As a fairly recent convert to MMJ, it took me almost a year to lose my love affair with rolling a blunt and suffering the noxious smoke to medicate. Trying to subtly partake of much needed sweet leaf relief was a chore, dodging into the alley next to my home and trying to avoid the gaze of curious kids was proving stressful. It was more the image of their dad smoking than the substance itself, of giving them a bad mental image that allowed them to “smoke” was not good parenting. Plus I don’t want to feel like taking herbal medication is something to be ashamed of. I used to be a cigarette smoker, many moons ago but having never ‘vaped’ I was not sure what to expect. I knew the device had to heat the dry herb to hit the off button on my considerable knee pain and I knew that three light-ish puffs on a ‘joint’ got the job done, albeit with that smokey aftertaste, aroma and fear that a neighbour may smell the err, medication. So I did some research and decided that a Pax 3 was the ticket, I almost purchased an entry level eBay special but figured that £80+ could be totally wasted (ha!) and I should go with a reputable brand. After reviewing our various recommendations I went and bought a Pax 3 from a local supplier. Evapo is a vape shop in Guildford mostly given over to liquid non-MMJ vape-ware, vaporisers, liquids and accessories but there was one cabinet market “CBD” which, given this is the UK, was a subtle clue as to what the cabinet held. The choice was limited to a Pax 2 or a Pax 3. Given that I am an inveterate tech-head I opted for the app controlled Pax 3. The salesman was a cheerful upbeat sort who talked discreetly but knowledgeably of the features/benefits and what a dry herb vaporizer did. Plus, Evapo had a 15% off deal that weekend which reduced the ticket price from £219.99 to £186.99. Seemed a bit steep for a first time vape purchase, I mean, what if I didn’t like it? What if I didn’t get the relief I am seeking? Hey ho, figured in the name of research it was worth the spend. Five minutes later I exited the proud owner of one spanking brand new Pax 3, and instructions on how to pair it up with the app, more on that in a moment. When I got home I opened the box, which is as stylish as the Pax 3 itself, very Apple design led. You slide the box out a sleeve, and it opens with a satisfying resistance provided by hidden magnets. I can see why they get the price they charge. It contains charger & USB charge cable, cleaning materials (pipe cleaners and pipe brush), a keyring that doubles up as a scraper, an oven like compartment with a holder for concentrates and waxes, a second half-charge oven lid, raised silicon mouthpiece and a stitched material sleeve and of course the device itself. The enclosed documentation is quite slim on any actual operating instructions, but does give you the limited instructions in many different languages. Plus a safety booklet, again, bereft of any instructions but telling you of the many dangers a device like this can inflict. Once released from its plastic coffin the device is pleasingly heavy in the hand. The heft gives it a solidity, again the comparison to Apple cannot be overstated. It’s solidly built up to a standard not down to a price. I choose a matt black finish and thus with one click on the top of the mouthpiece, the LEDs stood out like runway landing lights. I set up the device to charge, it already had 3 of the 4 lights lit, and within 20 minutes the remaining light blinked on and we were good to go. By the time the charge had finished I was ready to pair the Android version of the app with the device and had gotten to the point where you shake it to pair it. Try as I might my Google Pixel 2 XL running Android Pie (9.0) was just not having any of it, tried different settings on the phone and despite the phone stating it was paired, the app itself refused to play ball. I am guessing this is a Android Pie bug, maybe? I had only installed Pie on the phone a few days earlier so I am guessing app bugs are a distinct possibility. Many of the reviews however also noted pairing difficulties, so perhaps not? Later I downloaded the iPhone iOS app onto my iPad and that not only paired without trouble it also controlled the device well. Anyway, to the first trial, my ‘herb’ was ground and packed into the oven chamber, it took a relatively little amount, I would say half a single skin joint. I thought this seemed like a very minor amount given that the device allowed for several hits on one fill, but I went along with it. Within a couple of minutes I was ready to go, with a fully charged Pax 3 that was now also fully charged with bud I hesitantly hit the ‘on’ button. 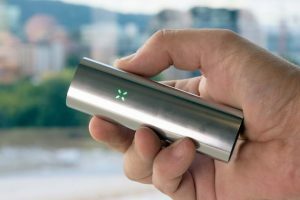 The device heats quickly 20 – 30 seconds and the flashing purple LEDs turned green notifying me that the Pax 3 was ready to dose me. I’d opted for the highest heat setting, I just felt that if I was going to try it then I should really give the Pax 3 a run for its money. I took a tentative first pull. The taste was not what I expected, a floral, greenery taste with a slightly timber smoke edge to it, not burning but that kind of smell you get in a wood on a hot day. I guess that’s the oils and the waxes boiling off their terpenes which give the bud its flavour profile. As the flavour died back and I exhaled it suddenly gave me a taste of coffee grinds, not full on coffee in your mouth but that half smell of roasting you get as you walk past a coffee house. Very pleasant, very smooth and much nicer than a pull on a ‘Fatty-Boom-Batty’. The specific stock I was smoking is not overpoweringly strong, but does do the job for my pain. As an example I can take a single pull on a one-skinner and have it hit the off button on my knee pain for a couple of hours but leave me focused enough to answer calls, write code and function without the distraction of grinding bone on bone action. I took a second tentative pull, and then thought, screw it, and took two much longer, deeper pulls. It was Saturday night and I was feeling like kicking back a bit so wasn’t concerned if I overshot the runway when it came to switching off the red flashing pain klaxon. As per usual the hits took time to kick in, with my usual method of ingestion it takes around 10 minutes for the meds to make their way into my brain and do what it does. Oh-so much better than the mechanised approach that codeine seems to take. Wrapping everything in cling film and preventing you from feeling pretty much anything but the ‘ready break’ glow (US readers Google it, you’ll see how accurate that actually is) that Codeine gives you. I usually then go make a cuppa, and settle into the sofa with my better half and wait for the pain to roll back and relief to roll in. Well, the Pax 3 definitely delivers, I was starting to feel the effects inside the ten minutes, and all was good. Everything suddenly felt very good with the world, in a way that pain seems to rob you of. Pain adds jagged pixelations to your every move, thought and sensation. It’s like you’re dealing with low resolution images and trying to pass them as 4K cinemascope. Codeine always took away the ‘jaggies’ but delivered a vaseline smeared lens perspective of the world. All soft focused and fuzzy edged, you felt like the world was a bouncy castle made of marshmallow. However the Pax 3, not only delivered the usual relief but somehow it felt less punchy, like the difference between a $20 bottle of bourbon vs $120 bottle of premium single malt scotch. You can see why the Pax 3 gets the reviews it does. Lets just say 30 minutes later as I am lying on the sofa, totally baked, I tried to have a chat with my other half and ended up giggling away as she laughed at me, not with me. I remained quite lucid, but was just very relaxed by the whole body sedation which is not how my current supply usually hits. The effect lasted at least 4 hours, in fact I went to bed and slept soundly, I usually wake early, 6:30 or 7am, woken by the knee pain, but I overshot that by at least 2 hours. Woke feeling fresh although a little fuzzy but coffee and breakfast sorted that for me. Therefore I wanted to avoid this with my second use, which was much more controlled, after a little bit of reading online. Just 2 short pulls and the device turned down to a less intense heat at 3 LED lights. I think this might be the sweet spot as the effects again took 5-10 mins to become very noticeable but there was much less of a body sedation, in fact I felt a clarity in my thinking and it just neutralised my pain. Before medicating I would put the pain at a 3 on our pain chart, far from unbearable but definitely ’nagging’ and niggling at me. So the two hits were a good amount to kill the pain but not dull my entire brain. In fact I would now consider a single pull at 3 lights during a working day. Maybe. I would give the Pax 3, 5 stars, but I have no other benchmark other than self-rolled all-weed blunts, joints and the occasional bong rip. I feel like I did when I upgraded to my first smart phone. Suddenly I had a computer in my hand and felt like I was ahead of the curve. The Pax 3 is very similar, having previously burnt a tube of rolled up dry herb I now have control and can set the temperature to the exact setting I want and get much more measured doses from my choice of pain meds. The only remaining variable of course is the plant material itself. I suddenly see that devices like the Pax 3 are invaluable in allowing pain patients to get closer to a proper dosing regimen and if they feel like having a little more fun on a Saturday night, then at least it is a choice. That, for me, is what Cannabis should be about, the choice, the choice of your medication, the choice to choose your own safe pain meds. That it is your body and therefore making a choice of herbal remedy vs the output of an industrialised process, is your right. 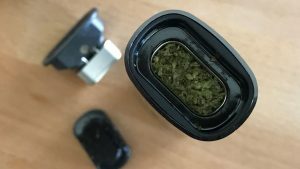 I wish I had tried a vaporiser earlier, the Pax 3 is a very good product that does the job without fanfare, but does it stylishly and without announcing to the world you partake. The only small downside was that after I had fiddled about with it, trying to get it to sync with my Android phone, and then using it to heat my herb it got a little warm. Not uncomfortably, or dangerously, but it did warm noticeably, which given its function is not unreasonable, but it got a touch warmer than I thought it would. Put that down to user expectations perhaps, but one to consider. I am exploring a silicon sleeve for it, just to make it the perfect portable medical device. 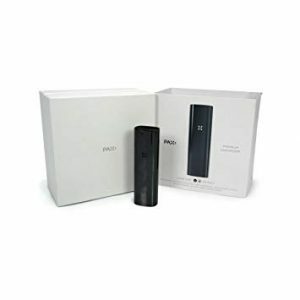 The Pax 3 is a total winner and I am very pleased with the value for money and recommend it to you if you are considering using a vape. If you have pain, don’t leave home without it.